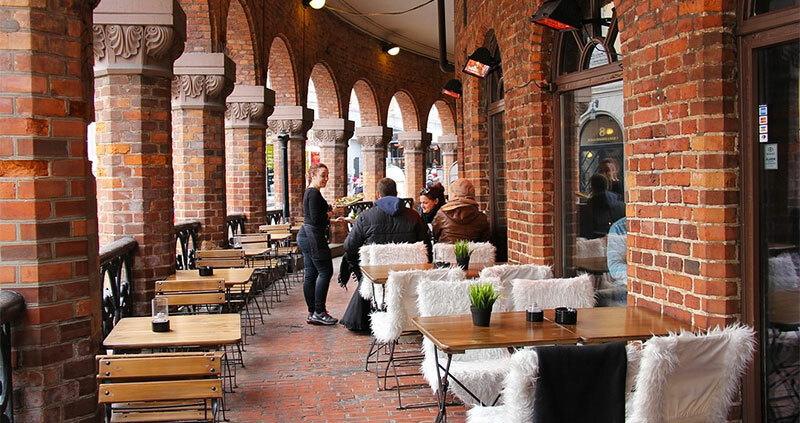 Finding cheap eats in Oslo is kind of difficult. 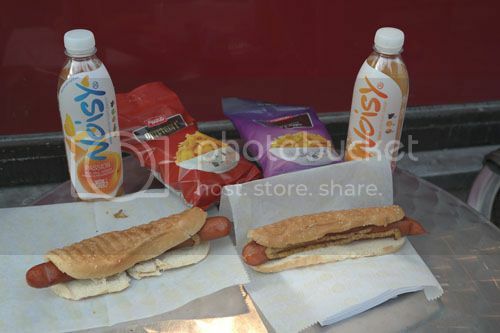 In fact, hot dogs were one of the cheaper options that we found. So “cheap” that we ate them more than once. Not the healthiest of meals for sure, but this is as filling and healthy as it gets when you want to eat as cheap as possible in Oslo. The good news is that these hot dogs taste much better than your typical Oscar Mayer dog in the US – in fact, they are closer to the organic 100% beef Applegate Farms hot dogs that we get from Whole Foods. The drinks are basically just carbonated fruit juices – not the best drink that I have ever had but certainly not the worst. What’s sad is that these drinks are cheaper than both sodas and bottled water. Needless to say, we had a lot of these fizzy juice drinks while in Oslo. Eating healthy in Oslo was more of a challenge than expected. Not only is the cheapest available food junk like these hot dogs and pizza slices, but most of the restaurants did not offer anything like a simple house salad or a bowl of soup. We got to the point where we just wanted something healthier that wasn’t hot dogs and fizzy juice and ended up at a Japanese restaurant that cost us around $60 for a meal. Moral of the story: healthy eating is very costly in Norway – at least when dining out. Grocery stores in Oslo are not really expensive at all. In fact, many things were cheaper than what we pay for them at Whole Foods. There we stocked up on things like organic apples and snacks for when we were out walking or wanted a snack in the hotel room. 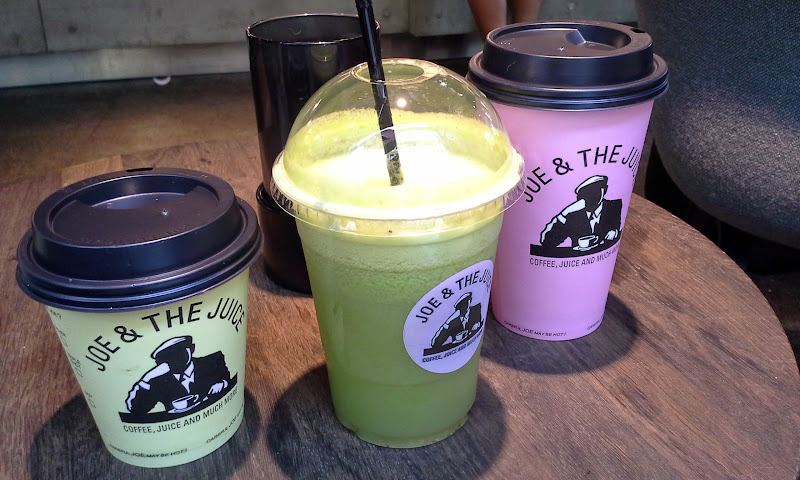 Our most expensive healthy indulgence was not the tasty Norwegian coffee but fresh juices at Joe & the Juice. It is a chain coffee and fresh juice shop where we got some of the best green juice that I’ve ever tasted. They make other fresh juice blends, serve coffee and specialize in a ginger latte that is just a latte with a shot of ginger juice. You can even get some paninis there, if you’re hungry. 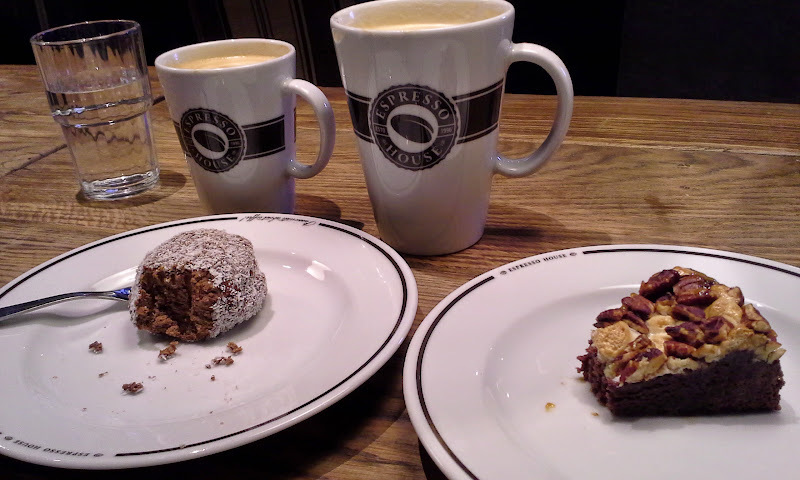 We also had more than our share of coffee while traipsing around Oslo. Norway is known for great coffee and each place that we tried got a thumbs up. Can’t beat a nice, smooth cup of coffee. Even the coffee machine at the hotel (only 10 NOK for a cup!) was good. Probably my favorite coffee shop that we went in was Espresso House. It’s a cool two-story place that is really large on the inside, plus they have loads of outside seating. Not only was the coffee really good, but they serve lots of different food and sweet treats. Since we’d already eaten, we opted to try a few sweet items. There’s also free wi-fi here. Another good place for coffee was Deli de Luca, which is the place where the “cheap” hot dogs came from. It’s part deli, part coffee shop, part convenience store. It’s also one of the few places that was actually open late. Well, there and McDonald’s. This trip is giving me a whole new appreciation of McDonald’s as it is one of the few places open late when you’re hungry or want a coffee. 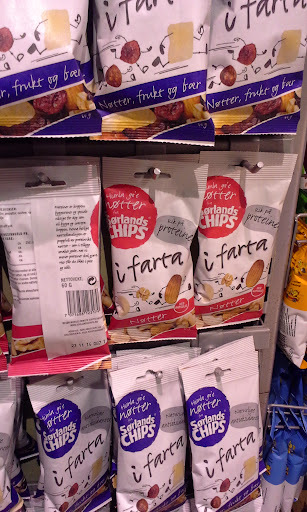 Sometimes when you’re traveling, dealing with a foreign language is all you need for a good laugh. Especially when it’s ridiculous bathroom humor. It’s some sort of trail mix, but also, hysterical. © 2019 Unlock Adventure | All Rights Reserved.